Mid-Winter 1927 Butler Bros. Catalog. SWIRL RIB Bowl - Smoke - 4.75 inches high x 10 inches wide. SWIRL RIB - Marigold - 9 inch diameter x 2.25 inches deep. Smoke SWIRL RIB Candy Jar - Courtesy Rick & Debbie Graham. Shown in April 1929 Butler Bros. Catalog. 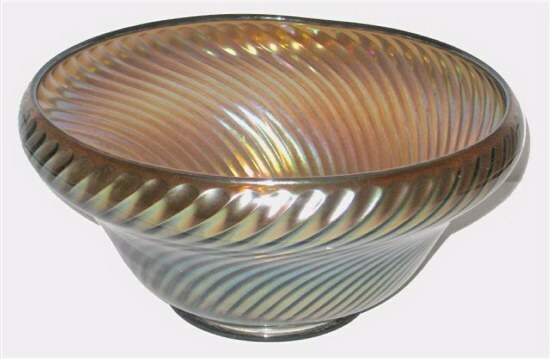 SWIRL RIB: is found in Bowls, 6”-9”–marigold, Candy Jar-smoke, ( rose marie, emerald green-may not be iridized? ), Candlesticks-marigold, Center-handled server-marigold, Creamer & open sugar-marigold, Cup/Saucer-marigold, Mug-marigold, Sherbet-marigold, clambroth, Plate-6”-marigold, clambroth, Plate - 8”- 9” – 12”, marigold. The minute differences in the swirl design can present question in some cases, as with the smoke Candy Jar. It comes down to a personal preference in naming it: Swirl or Swirl Rib? 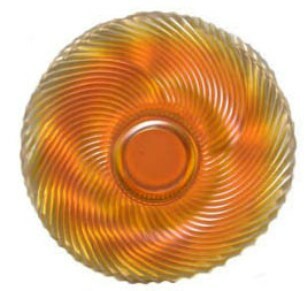 Apparently this pattern came late in the carnival glass period, leading into the Depression era. 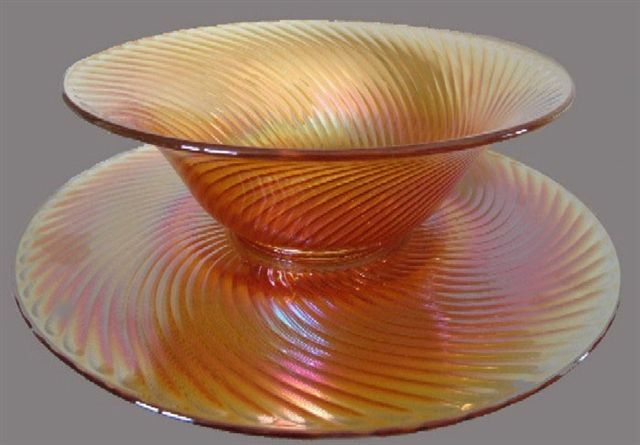 The candy jar and the 12” plate are not listed in some written accounts surrounding carnival glass. Smoke was not a known color when Carl Burns wrote his 1996 Imperial book. SWIRL RIB BOWL - 11.25 in. diam. and PLATE - 14.5 in. diam. - Marigold. An email including photos displaying sizes for this Swirl Rib set was received April 6, 2013 from Steve Lindquist and Gary Sullivan. The lovely set had been found that very morning! 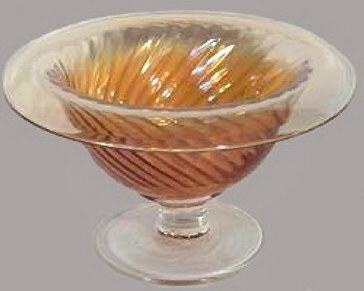 The bowl measures 11 ¼” in diameter and the plate is 14 ½” in diameter. The earliest ad for the Swirl Rib pattern is shown in the March 1924 issue of Butler Brothers Wholesale Catalog. Several plate sizes, along with other shapes are known in the pattern. 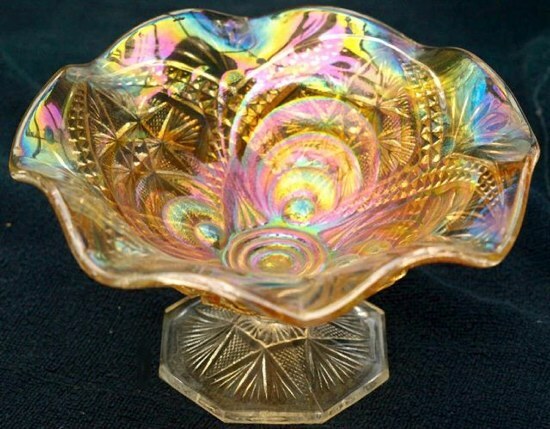 It is probably safe to say that this was a transition design away from previous carnival glass, into the Depression Glass era leading well into the early 1930s. Lg. Mgld. SCROLL EMBOSSED Compote with CURVED STAR Exterior. 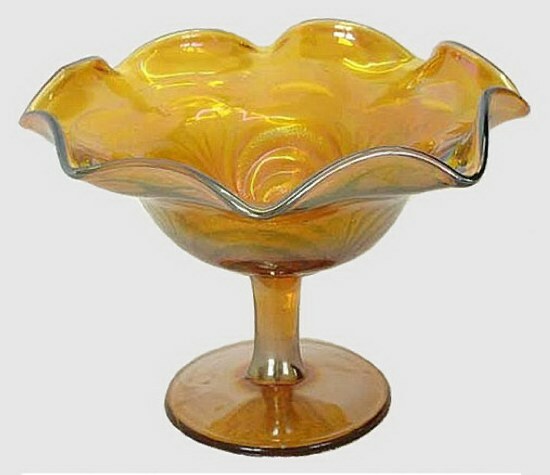 SCROLL EMBOSSED compote with plain exterior in Amber. SCROLL EMBOSSED compotes: There are three sizes in the compote style. The larger size usually displays the Curved Star exterior. Colors are marigold, purple and helios. The miniature size is quite scarce in marigold, purple and lavender. 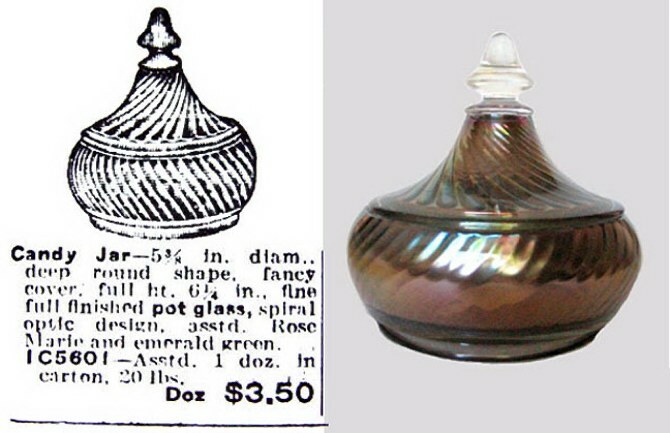 The compote shown here has a plain exterior and is found in marigold, purple, helios, amber, aqua, and olive green. 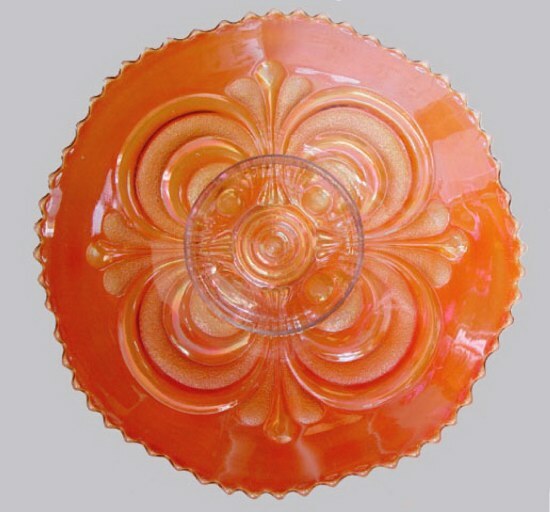 SCROLL EMBOSSED - 9 inch Marigold Plate having (plain marie). 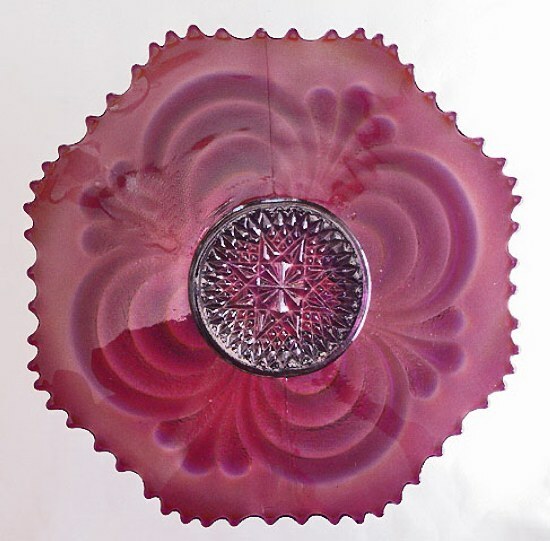 SCROLL EMBOSSED - 9 inch Purple Plate having (starred marie). SCROLL EMBOSSED 9” plate: Plates can have a starred marie or it can be plain. 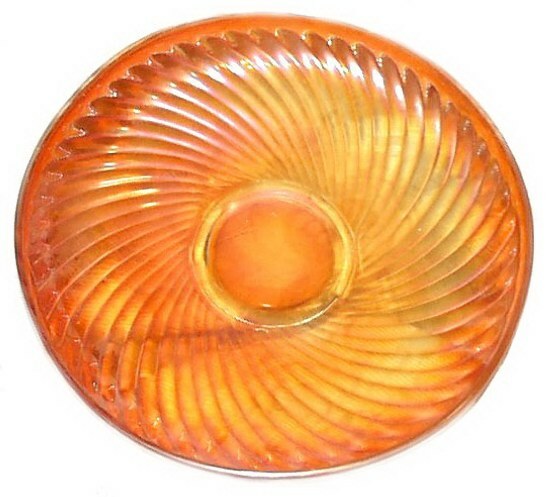 Marigold, purple, helios and aqua examples are known. Amber SCROLL EMBOSSED Sauce - File Exterior. SCROLL EMBOSSED 4”-5” sauce: These have the File Exterior, and known colors are marigold, purple, smoke and amber. Purple SCROLL EMBOSSED Bowl with FILE exterior - 6.75 inch diameter. 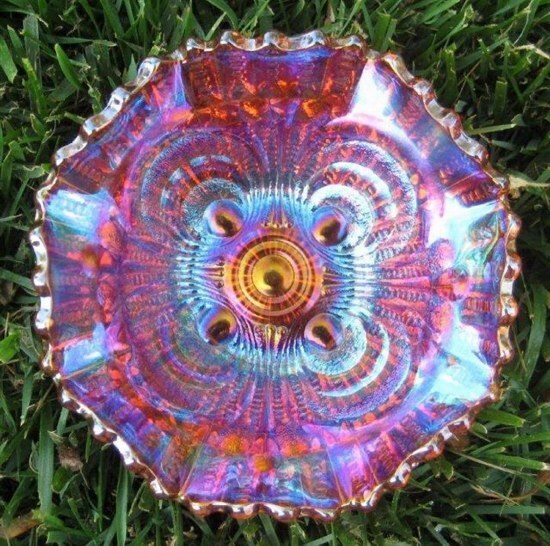 SCROLL EMBOSSED 6 ½”-71/2” bowl: Marigold, purple and smoke and the known colors for this size bowl. 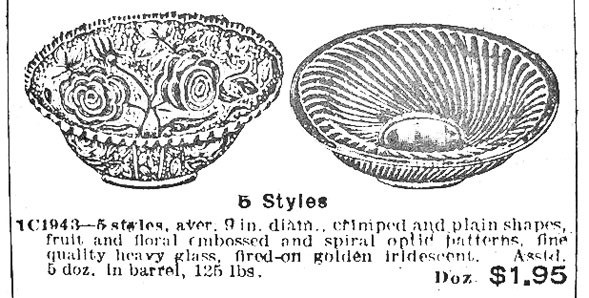 Plates and bowls in this pattern were offered in an assortment advertised in the Mid-Spring 1911 Butler Bros. Wholesale catalog. Nor foolish talking, nor coarse jesting, which are not fitting, but rather giving of thanks. has any inheritance in the kingdom of Christ and God. for because of these things the wrath of God comes upon the sons of disobedience.